Athenstyle v Atény, Řecko: Zarezervujte nyní! AthenStyle have a cancellation policy of no refund on the booking balance for a cancellation, no show or reduction in numbers upon arrival. Up to two weeks before arrival a reduction in price for reduction in number is possible at the discretion of the hostel. Up to four weeks before arrival cancellation is possible. AthenStyle Group terms&conditions apply and need to be signed by the appointed chief of the group. A security deposit of euro 500 is required and will be refunded upon check-out if no damages have been caused to the property and terms&conditions have been respected by the group. For groups over 10 people, please contact the hostel directly. Athenstyle is a relaxed, friendly hostel located less than 10 minutes' walk from most of the sights and museums in Athens. Hostelworld guests say the staff are 'extremely helpful and knowledgeable both about Athens and how to get other places from Athens'. 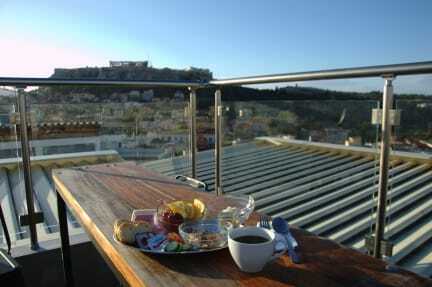 We like their rooftop terrace, perfect for breakfast and also featuring a bar and beautiful views over the city to the Acropolis. Open all year round, The Rooftop Bar is fully covered, heated and has a 360⁰ view! Join us upstairs no matter the weather! With over 10 years experience, yearly additions and renovations AthenStyle is a top quality hostel in Athens recognized by the international travelling community. Why stay elsewhere? Book your bed now, before it’s gone! We’re proud to be the only hostel in Athens selected by the Europe’s Famous Hostels Association. It’s no wonder why – we’ve got top ratings, a premium location and the best price! Our rooms are located in three adjacent buildings, full access to all facilities of the Hostel is guaranteed - Breakfast, Wi-Fi, computers, Rooftop Bar & Cafe, 24-hour reception, common kitchen, lobby, basement lounge, etc. Family rooms are one-room studios with a king-size double bed and a single bed (triple) or a king-size double bed and a king-size sofa bed or two singles (quad). Our Premium and most recent “Deluxe Double” & “Deluxe Twin” private rooms can be found in the new, renovated building just across the 24 hour reception. Bed linens and blankets are included in the price. Towels can be rented in dormitories for 2€. Toiletries & Towels are included in the price for family and private rooms. Our breakfast costs 4 EUR per person. Don't miss our rooftop bar and cafe! It’s newly renovated and surrounded with glass. Fear no cold and enjoy best views of Acropolis, Lycavettus and Filopappou Hills. The Rooftop Bar is open 8 - 10 am daily for breakfast and then all day long for food, drinks, Happy hour & Special Deals until midnight. We support a philosophy aimed at actively contributing to the environmental issues of the planet through use of natural energy and installation of energy-saving technologies, ecological colors and waste-recycling solutions. The Acropolis and the museums are all within walking distance and you can do it yourself easily. We will provide you with our suggested walking tour and free customized map. Monastiraki is famous for the flea market so check it out; you’ll find something cool for sure. Our neighborhood (Psirri) is well known in Athens for being the heart of the city’s nightlife and is now home to well-kept art galleries that have brought the art scene closer to life. Among the narrow streets you will discover a new artistic community that has shaped its studios amidst the food market, small wholesales shops of domestic products, theatres and old little stores. Lonely Planet said, 'the newest hostel in town, this bright and arty place has tasteful, well-equipped studios and hostel beds in a handy location within walking distance of the metro, major sights, restaurants and nightlife. Each dorm has lockers. Artists have painted murals in the reception and some of the rooms, and there's a cool basement lounge with art exhibitions, pool table, home cinema and internet corner. The small rooftop bar is ideal for evening drinks under the Acropolis. Payment is due upon arrival. Check-in: 2pm/Check-out: 10am. Late check-outs may be charged an additional day’s accommodation. ANY CHANGE or CANCELLATION in total or in part of the reservation MUST BE completed before midday (12.00) of the day before arrival by either fax or email. NO changes/cancellations (even partial) UPON check-in. NO REFUNDS. Phone cancellations will not be accepted. Your credit card will be charged in cases of “no show” or changes made not according to cancellation policy above. The amount charged will be the total of the first night of your reservation. To claim the percentage and the booking fee paid to an online booking company, you must get in contact with them. Payment is upon arrival. Check-out is no later than 10 am. Late check outs will be charged in any case with the following day. Check-in starts at 14:00 since rooms need to be cleaned. Please contact us if your arrival time change from the one in the booking. We reserve the right to give away your bed if you come later than 5 hours after expected arrival time. We make every effort to accommodate you in the dormitory size of your choice. However, because of the nature of our business, we may have to place you in a different sized dormitory. As a result the balance to be paid upon arrival can be slightly different to what is stated on your confirmation. We reserve the right to abandon or cancel reservations if the given information is incorrect or false and to refuse accommodation or end the stay before the reservation finishes if standards of behaviour are not met, in cases such as this no money will be refunded to the guests. We don’t send fax or letters for Visa document applications to consulates. What makes us special is our unique, chilled-out atmosphere. Just relax, bring a bit of your own positive energy, free your mind, meet up with our multicultural crowd and let our vibe lead you! Our famous Rooftop Bar is the beating heart of the hostel. Start your day with a coffee, a light meal or join us for Happy Hour & daily specials. Can't beat location, easy to reach from/to airport and ferry port, one metro line only, no changes needed! Get some tips from our staff for the day & follow your customized free map to discover the beautiful centre of Athens. After the sightseeing, chill out a bit in our cosy lobby or basement lounge so you could recover a bit and get ready for an evening in our rooftop...cold and cheap drinks, dishes from all over the world, cool people around and amazing views of the city - it\'s time to enjoy Athens at night!